Saturday, December 19, 2015 10:00 AM Beech Grove High School AWAY 48 Batesville High School HOME 30 Game Recap The Bulldogs were defeated in the opening round of the Batesville Invitational by a score of 48-30. Lane Oesterling led the Bulldogs in scoring with eight points, while Devin Scripture and Alex Westerfeld added six apiece. 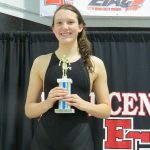 Saturday, January 9, 2016 10:00 AM Place 5 Points 18 Meet Recap The Eastern Indiana Athletic Conference swim meet was held on Saturday at East Central High School. The Batesville Bulldogs placed fifth with a team score of 18 points. The host Trojans claimed the team title with 105 points followed by Connersville with 93.